These were so easy to make. 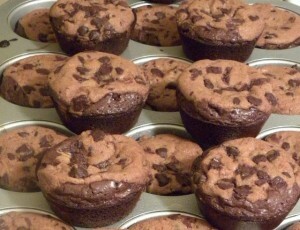 All you need is a box of brownie mix (along with the ingredients to mix it) and a tube of chocolate chip cookie dough. Prepare the brownie mix according to package directions and preheat the oven (according to the brownie mix directions). Spray cupcake tins (I ended up needing 21) and spoon 2 T. of brownie batter into them. Unwrap the cookie dough and cut it into 21 slices (or however many cupcakes you are making). Be sure to keep the round shape of the dough. Place your dough circles on top of each cup of brownie batter and place into the oven for approximately 20 minutes. Using a toothpick, check to see if the middle of the brownie is done before taking it out to cool. Let them cool on a cookie rack and then enjoy with a nice glass of milk! I made your brownie-cookie recipe and my family said that it was so good that they could eat more than at one sitting… So I would say it was a big hit…. thank you…. I’ve been making these for years!!! I’ve always baked the brownies a bit first but I’m trying your method…. Mine have ways come out a but doughy in the middle. (But that’s what my husband loves) its a bit sweet for me so I’m hoping this works! It’d also great with oatmeal chocolate chip cookie dough!!!! How big should the slices of cookie dough be? I just eyeballed it to split the log of dough into the number of slices comparable to the number of cupcakes I was going to make (minus the slices I needed to try out first…lol) I would suggest that it be no bigger than the slices you would cut if you were just making cookies…maybe even 3/4 the size.